What is Extraction of Tungsten? Extraction of tungsten has a different method, include gravity separation, magnetic separation, flotation process. It can only constant testing to determine the best way to the extraction of tungsten from its ore.
Tungsten minerals are tungstate. There are only a few cations which can bind to [WO4]2- complex anion during mineralization, mainly Ca2+, Fe2+, Mn2+, Pb2+, followed by Cu2+, Zn2+, Al3+, Fe3+, Y3+ and so on. As a result, there are only 20 kinds of tungsten minerals and tungsten-bearing minerals in the earth’s crust, namely wolframite, tungsten-manganese ore, tungsten iron ore, and so on. Wolframite; scheelite group: scheelite (perovskite), molybdenum scheelite, copper scheelite; tungsten minerals: tungsten, water tungsten, iron tungsten, yttrium tungsten, copper tungsten, hydro tungsten aluminum ore; unusual tungsten minerals: tungsten lead ore, clinoptilolite, molybdenum tungsten lead ore, tungsten zinc ore, tungsten bismuth ore, antimony tungsten pyrochlore, titanium yttrium thorium ore (containing tungsten). Tungsten) and tungsten sulphide ore. Although more than 20 kinds of tungsten minerals and tungsten-bearing minerals have been discovered, wolframite and scheelite are the only ones with economic value for mining. Wolframite (Fe, Mn) WO4, containing WO3 76%; scheelite CaWO4, containing WO3 80.6%. Tungsten is a widely distributed element, almost found in all kinds of rocks, but its content is relatively low. It is possible to form deposits as commercial ore mining by enriching the geological processes. Tungsten ores are mainly divided into wolframite and scheelite. Wolframite is the most important ore to extract tungsten. It is also called wolframite. Wolframite is brown to black with metallic or semi-metallic luster. Scheelite is granular in shape, white with yellow and fat luster. Orange, double cone-shaped crystals with large crystals and transparent, deep orange. Coexisting with calcite muscovite and black cassiterite, scheelite and calcite are fluoresceins. Heated or UV irradiated, slightly purple. It is the main raw material for tungsten smelting. 2 How is the extraction of tungsten? Tungsten ore processing methods are mainly hand selection, aviation model selection, gravity separation, flotation, magnetic separation and electrostatic separation. In the tungsten processing plant, the extraction of wolframite is mainly gravity separation while white ore is mainly flotation. In order to comprehensively extract useful components, improve product quality and recovery rate of tungsten concentrate. The combination of mineral processing and smelting technology improves baking and leaching and other wet refining methods. In general, the Tungsten ore processing machine of heavy selection is generally used, and the ore dressing of Tungsten ore with a high degree of dissociation of the monomer is basically the same as the ore dressing of gold ore, and the better ore dressing index can be obtained by simple screening. For extraction of Tungsten ore with a low dissociation degree, it is often necessary to break the secondary structure by bar grinding and other processes, so as to improve the recovery rate and concentrate grade. The basis of the gravitational separation of sand tin ore processing machine is also the principle of gravity separation. According to the specific gravity difference between tin ore and waste stone, the proportion of tin and waste stone in the tin deposit is very good, and the beneficiation effect can be obtained by the method and equipment of heavy separation in tin ore processing plant. At the same time, the advanced Tungsten ore processing plant has the advantages of high efficiency, energy saving, environmental protection and so on, the investment of equipment is small, and the operating cost is low. It is an ideal choice for the beneficiation of sands. 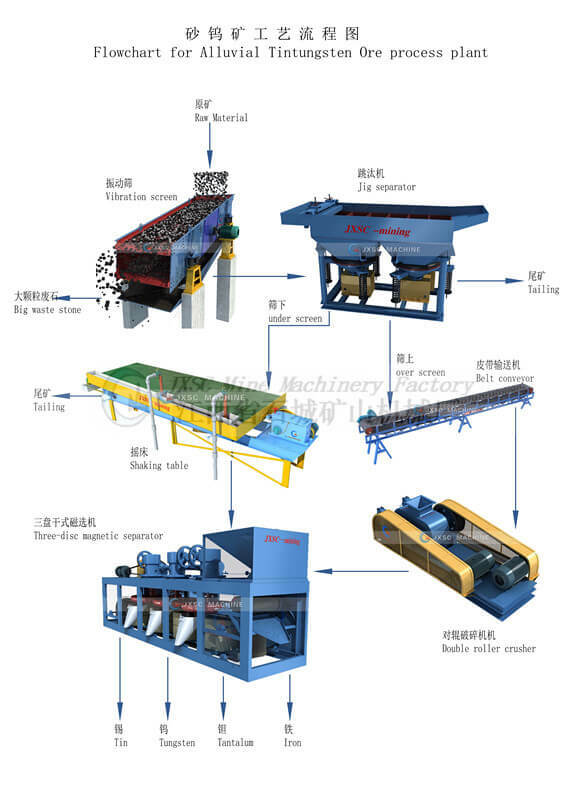 The equipment for gravity separation of sand tin ore is mainly jig concentrator. Sometimes, the rocking bed is also used to improve the recovery rate of fine-grained tin ore. The technological process of gravity separation for sand tin ore is screening, jigging and dewatering. For the sand Tungsten ore with a low degree of dissociation, two reelection processes are often needed: screen jig, rod mill, jigging and dewatering. JXSC mine machinery Company in China has more than 30 years professional experience at Tungsten ore processing plant, design full set Tungsten ore process flowchart, provide complete set Tungsten ore processing plant, can send an engineer to mine site for equipment installation and commissioning guidance. Have already built many Tungsten ore processing plant in Africa countries. Include China, Brazil, Bolivia, Malaysia, Nigeria, Myanmar, Australia, Mongolia, Kenya, etc. The feeding way, primary separation, final concentration and Tungsten ore refining process are almost the same as above alluvial/sand Tungsten ore processing plant. Crushing: for crushing the big rock Tungsten ore stone to a smaller size before grinding. crushers can be rough rock Tungsten ore jaw crusher, rock Tungsten fine jaw crusher, rock Tungsten cone crusher, rock Tungsten hammer crusher, roller crusher rock, depends on the rock Tungsten ore feeding size and process capacity to use which kind crusher. Grinding: after crushing the stone to a smaller size, need to grind to power by tin ore ball mill grinding machine or wet pan mill or other rock grinding machine, so the Tungsten concentrate can be released out from stone. Then go to the gold separation machine and concentration machine( Tungsten ore shaking table). Extraction of tungsten research also has a positive effect on the extraction of tungsten from scheelite, extraction of tungsten from molybdenum, extraction of tungsten from wolframite, extraction of molybdenum and tungsten. JXSC provides a full of mining equipment of tungsten mining process, wolfram mining, gold processing and so on mineral exploration plant.